Make A Luxurious Lavender Bath Spa. Stress is a killer. You have heard this more times than you can count, right. You cannot get away from it but you can at least reduce its effects by giving yourself a bit of therapy in your own home and for a lot less than if you were to buy expensive bath salts. The Romans loved it and the ancient dynasties of china used it. Lavender the word itself is derived from the old Latin, lavo meaning, to wash. It is one of the foremost fragrances used in aromatherapy because of its soothing properties. Hot water only makes it all the more relaxing. Magnesium sulfate is a chemical compound commonly referred to as Epsom Salt. It is named for the town in Surrey, England where it was originally distilled. It works by converting acoustic energy into heat in water. This is not the only reason that bath salts are made with Epsom salt. It raises the specific gravity in water so that bodies are more buoyant and it also keeps the skin from wrinkling so that you can remain in the water longer. It also reduces inflammation in joints and muscles. This lavender scented bath leaves you so relaxed that the only thing you will want is a nice long nap. The magnesium sulfate also lowers blood pressure as well as adrenalin. You start with the dry ingredients. Mix them together thoroughly. Add in the essential oils and mix it in so that the salts absorb it. Make sure you are working in a well-ventilated area. Next mix both colors together in a separate dish. Mix the coloring in until all granules are colored. Now spread the results out on wax paper to dry and in a few short hours you will have made your very own lavender bath salts. The following blend recipes are using lavender oil to make a relaxing and comforting bath after busy day. 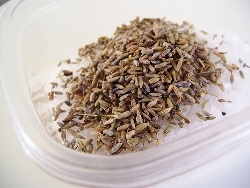 Place the lavender buds and the oatmeal into a muslin bag. Secure the contents in the bag by tying it with a rubber band or a string. After securing the bag, tie it with a string or a ribbon so the bag does not go to the spigot of the bathtub and is also secured under the bathwater. After running the bathwater, soak into the tub and lather the cloth to your skin and this combination will help soothe the skin and induce calm to the nerves too. Combine all the ingredient and place in the muslin bag. Tie the bag under the tap so the water can run through it. Stimulating the aromatic properties. Float the herbs as you soak. Close your eyes, lies back and breathe in and out gently. Youll feel calm and ready for bed after 20 minutes. To wind down just before bed time soak in a lavender and chamomile bath. Both scents promote relaxation and sleep. Chamomile also helps relive menstrual cramps. Steep the flower in the water. Add the rest and pour into a bottle. Leave overnight.Pour into warm running water and settle in for a comforting bath. Where to buy the ingredient? A lot of people use these as gifts for friends and relatives as well as for themselves. Lavender grows wild in Europe and is being cultivated in the US now. It is a hearty plant and looks great as a part of any landscape. You can purchase lavender bath products in salts, gels and body wash. These products all give you the benefits derived from breathing in the soothing and healing fragrance of this most useful plant. For more information about lavender oils and how to get some for your own bath follow the links below. Another way to relax is using Lavender Bath Teas,Lavender bath teas are an easy way to have a scented and therapeutic bath even if you aren't comfortable with or don't have essential oils. Before you take a bath, You can do a massage over your body using lavender massage blend.